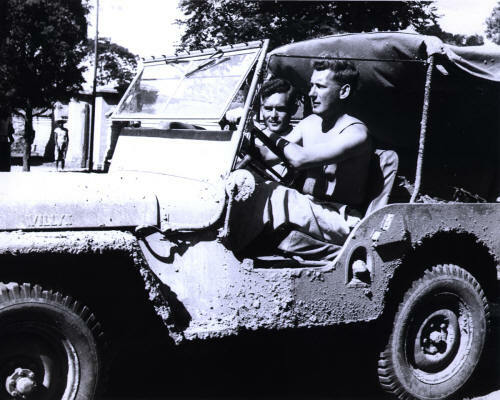 Rowan (driving) serving as United Nations transportation officer and maintenance chief Claude Lievsay in the passenger seat of their mud-spattered jeep. A bullet hole is visible in the lower left corner of the windshield. Rowan, then 27, poses with a smartly uniformed Communist sentry guarding the Village of Xihua in Henan Province. The guard paid no heed to Rowan's attempt at conversation. A sweating Rowan poses for Life photographer Jack Birns in front of Communist terrorist leader Lau Yew's burning shack. The shack had been torched after the leader was shot to death by Bill Stafford. Moments after this photograph, some 50 more terrorists, who had slipped undetected into the jungle hollow, opened fire. Rowan dove into a nearby creek smashing his eyeglasses and scattering the rolls of exposed film from his unzipped shoulder bag. The film was later retrieved after the attackers were driven off. Rowan and photographer Jack Birns hefting 400-Troy ounce gold bricks in smuggling syndicate's steamy basement foundry in Macao in 1949. Smelted into ten-ounce bars, the gold was then hidden aboard junks destined for black markets in Shanghai and other China ports where the Nationalist currency had become virtually worthless. Rowan and pilot Moon Chin, before evacuating Shanghai. Moon Chin was Chiang Kai-Shek's personal pilot at one time. Rowan boarding the Orient Express. Rowan in close quarters with Teamster president Jimmy Hoffa, working on Life Magazine's three-part series on the teamsters. Rowan virtually lived with Teamster president Jimmy Hoffa for three weeks while he and photographer Hank Walker gathered information for a Life Magazine series on the teamsters. At his Woodner Hotel apartment in Washington, Jimmy even cooked Rowan breakfast. Rowan walks with Time photographer David Kennerly in Hanoi the day before the American POWs were released. Rowan stands in front of the Great Wall in a return visit to China in 1973. In the White House Oval Office, Rowan tape-records President Ford's blow-by-blow account of the military action he took to secure release of the Mayaguez, the American cargo ship in 1975. Rowan, who wrote a book about the incident, flew back from Hong Kong for the taping session. Rowan visiting with President Saharto of Indonesia. Rowan sitting with Presiden Chiang Ching-Kuo, President of the Republic of China (Taiwan). The interpreter is James Soong, the new acting Director-General of the Government Information Office. The "Iron Butterfly" Imelda Marcos, lunching in Manila with Rowan at the peak of her power in 1979. He had flown out to Manila from New York to write a pair of articles about her for Life and Fortune. The next time he dined with her was in 1986, just before she and her husband were deposed. Rowan with First Lady Imelda Marcos (in her Girl Scout uniform) during a flight in the Philippines on her private plane. Rowan with President Marcos of the Philippines in the Malacanang Palace. Rowan interviewing President Marcos of the Philippines just before he fled to Hawaii. In January 1990, Rowan spent two weeks on the streets of New York City disguised as a homeless man for an article in People Magazine. Rowan shares a park bench in New York during his two weeks disguised as a homeless man. His article describing the perils of homelessness appeared in People Magazine in 1990. Rowan poses with former president Gerald Ford at the Mayaguez reunion in Beaver Creek, Colorado. Rowan spending time with former presidential candidate Ross Perot. Rowan gesturing in a conversation with former presidential candidate Ross Perot.